InterCity XPT, in the candy livery, stands at its departing station. The XPT celebrates 20 years in service in 2002. Before you begin any loco or rolling stock downloads from Train-Sim.com, there are a couple of excellent demos to install from other sites. Once you've got these, you'll be able to download others of a similar type and re-use the protypical cabview and sounds (the technical term you'll come across for this method is "aliasing" - more about it later). As a general rule, webWiz decides what to download and add to MSTS by looking for a loco that has its own cabview and sounds. Not much point in driving a loco that may look different from the outside but uses another loco's engine characteristics and cabview! For passenger coaches, there are cases where a design is so good that there's no choice but to download! 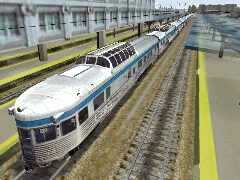 An example is the VIA passenger set with the dome car or the Chesapeake & Ohio set with the observation car. When you get to downloading activities, the challenge of completing the activity will over-ride the fact you may have to download extra rolling stock, regardless of download time and disk space. webWiz, you'll see, is biased towards diesel locos - there's nothing like the sound of an EMD V-16 turbocharged 2-stroke pounding the sub-woofer! If your interest is steam (UK, Europe or USA) or UK or European locos and rolling stock, you'll find plenty to whet your appetite at the sites listed. An SD70MAC heading a consist of Boeing freight cars of 777 fuselages leaves the shunting yard. VIA passenger cars, headed by VIA F7A-B-B-A locos, stand at Washington platform 14. Recently announced, and available to all towards end of March: RS11 Budd Rail car set, CWAC60 locos (including one in BHP livery). 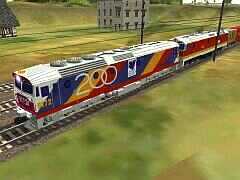 NSW Class 81 in Olympic 2002 livery and helper lead a Superfreighter. Southern Pacific SD45T-2 No. 6801 departs Glacier park with a consignment of Boeing 737 fuselages and parts. Passengers enjoying the refreshments provided in the observation car. Valley Pass: VIA F40 loco, VIA train set - creative work! Auran: The formidable Union Pacific DD40X, a special loco UP built to celebrate its centenary (really 2 SD40s on the one chassis). This loco deserves its own cabview: dd40upg.zip (1.3Mb, 17-Nov-01), f45cab.zip (3.3Mb, 05-Nov-01), f45v11.zip (500Kb, 26-Dec-01) at Train-Sim.com. webWiz promises a special page of instructions to get the best out of the DD40X. You have to register (it's free) at Auran - it's a bit messy but worth it to get the DD40x. Justin Cornell's loco sets: Dash 9, GP38, SD40, SD40s (his web site simply lists the downloadable zip files).